Of Microscopes and Monsters describes a journey through the hidden worlds of Britain's rivers and lakes. It shrinks the reader to just a fraction of a millimetre in size to reveal microscopic landscapes crammed with bizarre and unexpected organisms. 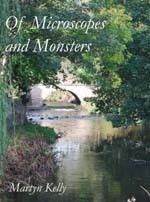 Travelling from chalk streams in southern England to remote Scottish lochs, the book not only describes and illustrates hidden facets of Britain's biodiversity, but also explains the role that these organisms play in ecosystems and the reasons why we should be concerned about the state of our rivers and lakes. Along the way, readers also travel through the shadowy borderlands where ecology and politics meet, and encounter the labyrinthine environmental politics of the European Union. Of Microscopes and Monsters is a readable and informative popular science book which opens the door on an aspect of natural history that is extremely common yet, at the same time, barely known or understood. You will need to have Adobe Acrobat installed in order to read this file.